A small portion of the Automate/ProMat 2019 expo halls. CHICAGO — There were many commercial robots at Automate and ProMat 2019 here last week, but which ones stood out? Developers of robotics for the manufacturing and supply chain industries could see exhibits by component makers and complete solution providers, as well as conference panels on applications. The Robot Report culled the following observations from discussions with engineers, suppliers, and analysts at Automate/ProMat. Many of the exhibitors and conference speakers said that designing for ease of use is essential to helping robotics spread beyond automotive and electronics manufacturing. This year’s Engelberger Award winners, Howie Choset of Carnegie Mellon University and Catherine Morris of the Association for Advancing Automation, have both spent much of their careers helping to make robots easier to use. Collaborative robot arms and mobile platforms can help manufacturers and logistics providers of all sizes, but programming and integration have to become easier before small and midsize enterprises will adopt more. In addition, there were new SCARA models from market leader Epson Robots, as well as Stäubli, TM Robotics, and Yamaha that they said were faster and more affordable. Software is also being designed to help users more quickly get robots working. For instance, Ready Robotics‘ Forge product line is intended to make controlling both industrial and collaborative robots easier. Similarly, Sisu said its VUDU visual programming interface and controller don’t require any programming experience. A major driver for the growth in mobile robots is the need for greater flexibility in factories and warehouses. From autonomous forklifts and tote conveyors to heavy-lift platforms, mobile robots can enable users to work with existing, non-standardized facilities. They can also help avoid the costs of bolted-down infrastructure such as stationary conveyors, multi-layer racks, and positioning systems. Cobots and AMRs were two of the best-represented types of robots in McCormick Place. More than 50 mobile robot vendors had booths at Automate/ProMat 2019, observed Mike Oitzman, founder of Mobile Robot Guide. While there were still plenty of automated guided vehicles (AGVs), particularly at ProMat, several suppliers touted the more advanced navigation and obstacle avoidance of autonomous mobile robots (AMRs). Mobile carts for e-commerce order fulfillment were joined by a new wave of accessories. For instance, 6 River Systems added Mobile Sort to its product line. The system combines machine learning with mobile sort stations and 6RS’s Chuck mobile robots. The company also featured demonstrations in which attendees could race with the robots. Another MiR partner, Nord Modules, displayed its modular system for lifting and loading payloads onto MiR’s mobile robots. Relative newcomers to the U.S. market for AMRs included GreyOrange and Geek+. On the navigation side, Humatics and Vecna Robotics’ partnership and Amazon’s acquisition of Canvas Technology are examples of how companies are collaborating to improve and spread their offerings. Several mobile robot vendors displayed larger platforms at Automate/ProMat 2019, including Clearpath Robotics, Fetch Robotics, MiR, and Waypoint Robotics. These larger robots are a far cry from the carts that follow (or lead) warehouse workers. Not only are they able to move autonomously through more dynamic environments, thanks to cheaper lidar and more sophisticated software, but they can also serve as mounts for multiple collaborative robot arms. Some are big enough to carry a car chassis, leading to visions of more flexible manufacturing. Imagine, instead of a car moving down an assembly line to be worked on by single-purpose machines, a swarm of robots moving around the vehicle. Such heavy AMRs could also be useful in construction and agriculture, growing applications for robotics. At Automate/ProMat, there was as much of an emphasis on the utility of cobot arms and grippers as on new models. “I want people to stop buying robots and to start buying applications,” said Enrico Krog Iversen, CEO of gripper maker OnRobot. More than 80 UR cobots were on display in 34 booths at Automate/ProMat. For instance, Robotiq, a partner of Universal Robots, displayed its new vacuum grippers and sanding kit. The number of competing cobot makers is leading to specialization and a race to add capabilities. AUBO Robotics showed three new, long-reach cobots in Chicago. Omron Automation also showed off human-machine interaction in its “Factory Harmony” demonstrations, which included vision-guided robots, laser-marking tracing, and its mobile robots and new TM-series cobot. In addition to the cobots offered by the top industrial automation vendors — ABB, FANUC, KUKA, and Yaskawa — Automate attendees could see Sawyer from Rethink Robotics, whose brand continues thanks to the Hahn Group. The combination of mobile and collaborative robots seems obvious, but the challenges of power, safety, and precision have taken time to overcome. Several mobile manipulators were demonstrated at Automate/ProMat 2019, but there have been relatively few use cases so far. As part of its “smart production” demonstration at Automate (which it also showed the week before at Hannover Messe), Stäubli International showed its HelMo mobile robot, which included a cobot arm. “Our smart production cell is ideal for small-batch manufacturing,” said Sebastien Schmitt, North American division manager at Stäubli. KUKA’s KMR iiwa is a cobot mounted on a mobile robot, using SLAM (simultaneous localization and mapping). IAM Robotics last week demonstrated expanded capabilities for its Swift mobile picking robot, as well as Bolt, its new tote-transport robot. Coming to the U.S. is Magazino’s Toru robot, which is designed specifically for picking and placing shoeboxes on shelves. It’s able to do so from the lowest shelves and from beneath other boxes, explained Florian Wahl, public relations manager. In Europe, returns are usually free within two weeks, so goods there have a 40% return rate, he said. Magazino is expanding its mobile manipulation with Soto, which has a bigger gondola for totes. One of the flashier debuts of the past week was Boston Dynamics’ Handle robot, a wheeled, ostrich-like mobile manipulator for reaching and moving large boxes. While mobile version wasn’t at the show, the company did have demonstrations of the industrial arm and suction grippers. On a larger scale, Honeywell Intelligrated, which recently partnered with Fetch Robotics, introduced its robotic unloader, which can operated autonomously to empty a truck. Most hardware makers would contend that their robots have not yet become commoditized, but they might agree that the software stack is becoming increasingly important and specialized. In addition to perception, navigation, and manipulation, developers are building layers for data sharing, controls, and security. RightHand Robotics Inc. released its RightPick2 platform for robotic pick-and-place operations. It combines the RightPick.AI vision and motion-control software using deep learning with hardware upgrades. “The [first version of the] RightPick platform has successfully completed 10 million picks autonomously across many industries, including e-commerce, retail, pharmaceuticals, grocery, and more,” said Leif Jentoft, co-founder of RightHand Robotics. XYZ Robotics‘ Rebinning Station and Picking Station uses machine learning to speed up piece picking. PlusOne Robotics said it “creates order from chaos” with its software for mixed parcel singulation, remote robot management, and quality assurance for parcel induction. Locus Robotics’ “Spring 2019” software release is “the industry’s first, full omnichannel support that seamlessly handles all aspects of fulfillment for retail, wholesale, and e-commerce channels,” said CEO Rick Faulk. Tend.ai was an example of a company actually applying artificial intelligence to predictive maintenance for manufacturing. There were also stationary robots using intelligent grasping at Automate/ProMat, such as those of Kindred. Inspekto’s autonomous machine vision system is designed to eliminate the need for vision integrators and to work, regardless of lighting conditions, said attendee Harel Boren, CEO of the Israeli-German company. At the same time, many of the references to AI at Automate/ProMat were about machine learning for vision, navigation, or grasping rather than deep learning or robots actually using AI, noted Frank Tobe. At Siemens’ booth, videos demonstrated how Xsens’ 3-D motion-tracking system can add humans to digital twins of processes. While there was a lot to see at this year’s Automate/ProMat, several attendees said that they saw little that was groundbreaking. However, the latest models of AMRs, cobots, and industrial automation did show incremental improvements in sensors, software, and end effectors. Servo provider Kollmorgen livened up the show floor with its boxing robot display, and other component providers were scattered around the Automate/ProMat expo halls. Robotics companies from Denmark and Massachusetts were well-represented at Automate/ProMat 2019, but suppliers from China to Germany were focused on growing existing markets and finding new applications. “Our product has been used for critical systems such as surgical robots, and we’re expanding in industrial automation,” said Energid’s Tardella. Even as Western companies try to expand in Asia, South Korea-based Doosan Robotics entered the North American market with its cobots at Automate/ProMat. Industry 4.0 or the factory of the future might be coming, but many robotics developers at the event said that they’re watching technologies such as the Internet of Things (IoT) and 5G to see how they’ll affect their businesses. ABB recently signed a memorandum of understanding with Ericsson to work on adding ABB’s automation with Ericsson’s high-performance connectivity. The Association for Advancing Automation (A3) and the Material Handling Institute (MHI), the organizers of Automate and ProMat, respectively, have said that they have outgrown their colocated space in Chicago. The next Automate will be in 2021 in Detroit, while ProMat 2021 will stay in Chicago. 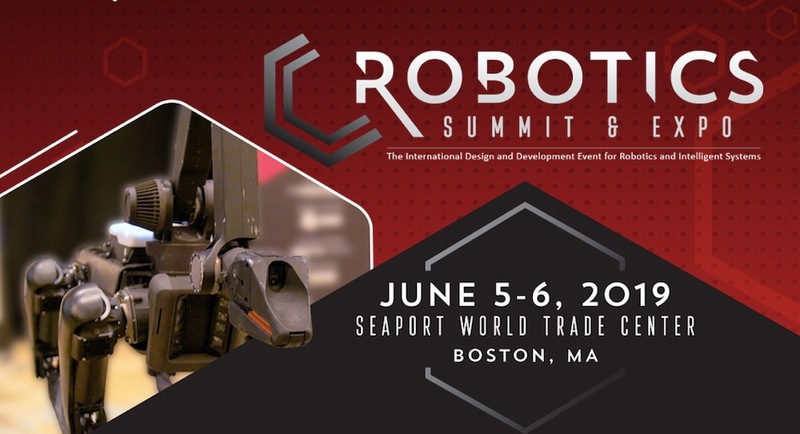 In the meantime, robotics developers, integrators, and users can look forward to the Robotics Summit & Expo in Boston in June, as well as A3’s Vision Show 2020 in Boston and MHI’s Modex 2020 in Atlanta. You need to change the process before you automate it. Robotic arms are crude forms of first-generation automation. Sometimes referred to as paving the cow pass (Google it). A couple of years from now all of these solutions for fulfillment will be obsolete. This is horse and buggy, We got cars and planes coming. Buck, thanks for the comment. Couldn’t agree with you more, which is why it’s so exciting to see where the robotics industry is headed. Were you at Automate? Yes Steve, I spent16 hours on the Promat/Automate 2019 floor, at times when it wasn’t so busy. Gone to most of the shows for many years. We are developing entire automation, from truck in, to truck out. Lights out unattended e-commerce. This includes boxes -on-demand right-sized, at 50 boxes-per-second.